By definition, @U2 was born on October 23, 1995. That’s the day we use when celebrating the site’s birthday, and we’ve had a couple pretty good parties over the years (even on different dates). But in another sense, @U2 was kinda born 15 years ago today: February 12, 1997. 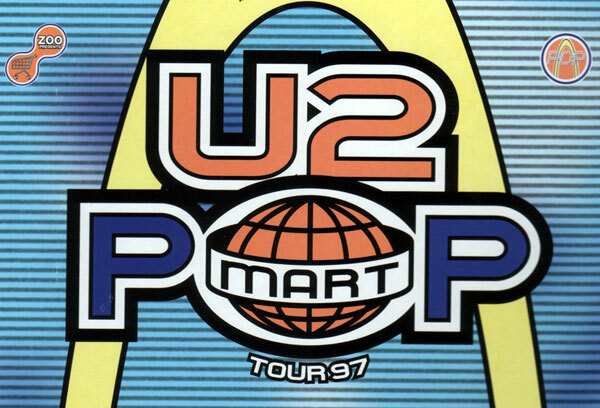 That’s the day that U2 announced its PopMart Tour from inside a K-Mart store in Manhattan. And it’s the day that the 16-month-old website really became a legitimate and popular online source of U2 news. On that day, I knew that it was going to be something bigger than a normal hobby site. In the days and weeks leading up to the tour announcement, there was incredible buzz on Wire — the major U2 listserv of the day — and on other U2 communities like CompuServe and AOL. Fans were looking for any bits of news they could find, which mostly amounted to rumors. I recall posting articles and bits of information on the website, and then sending out the link to the various online communities … and the hit counter always went up when I did that. (Yes, I said “hit counter.”) Now, I’d been posting U2 news on the site since the beginning, but with the tour approaching, any little nugget of info became breaking news and drew a lot of traffic. So, as the 12th approached — and it had been known in advance that U2 would be announcing the tour on this date — I had to think about how @U2 was going to cover the news. 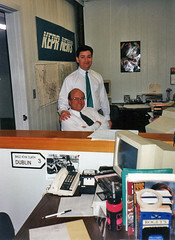 I was the Sports Director for KEPR-TV at the time — the local CBS affiliate here in Tri-Cities, WA. I did the sports weeknights at 6 pm and 11 pm and was mostly a one-man department. That meant getting sick or taking a day off was a real pain in the arse for the station. They’d have to pull someone else away from their regular tasks to do sports. Nonetheless, as the 12th approached, I decided that I was going to play hooky. I didn’t think I had much choice, actually. There were a lot of U2 fans online that would be visiting the website looking for news, and I felt more obligated to report that than to report the day’s local sports. To this day, it still amazes me that I decided to call in sick from my job to update a website with U2 news. Did I really do that? Yep. I called in sick that morning, and then turned on my TV and fired up the computer. I think it was an Apple Performa 450 at the time, and I might’ve had a 14.4 or 33.6 modem. Good times. My memory is shaky, but I vaguely recall that the announcement would begin at Noon at K-Mart — or 9 am my time. MTV wasn’t airing it live, as I recall, but they’d certainly report it pretty quickly in those twice-an-hour MTV News updates hosted by Kurt Loder (or whomever it was then). But there was a huge problem: we didn’t get MTV live in those days. It was delayed; even if MTV News had the story by 12:30 pm ET, I wouldn’t see it until 12:30 pm PT … three hours after the fact! So, TV was pretty useless. But there were numerous music news websites at the time — All Star Magazine, Addicted To Noise, JAM Showbiz (which still exists) and others. MTV even had a website then, as did a few major news publications. Google didn’t exist yet, but there was Yahoo and a few other search engines that I’m sure I used … probably Excite, Northern Light and others. I kept an eye on all the music news sites I could find, and all the U2 forums/communities/mailing lists. I must’ve hit refresh 200 times that morning. I don’t know where I first found the tour news, but I remember posting a couple shorter bits of info and then …. BAM! …. MTV News had posted the entire list of dates and details online. They also posted some video from the news conference, and I had software on my Performa that made it easy to do screenshots, so I took a few of those. I posted the news, emailed the mailing lists, notified the online communities and the rest is history, as the saying goes. Even though I’d been posting news for ages, getting the full list of PopMart tour dates online really established @U2 as one of … maybe THE … go-to sites for U2 news online. I recall the hit counter was off the charts that day, and for several days afterward. And it never dropped back down. And, maybe the most important result of all was that, as more people visited the site and sent in news to share with other fans, I was able to start growing out a staff. For a while, it was just me and one other person posting news. Then it was 4-5 people. Then 8-10. Then a couple dozen. And today, we have about 40 people involved in one way or another. All volunteers, me included. It blows my mind. So, yeah. February 12th will probably always have a special place in my heart and mind. It’s not @U2’s formal birthday, but it’s the day that it started to become what it is today. Thanks, PopMart.